Designed by Mark Wootton. Orignal Design by David Williams. Additional development by Eric Jome, Konstantinos Thoukydidis, and Steven Martino. Senior Editor Jon Bolding says: A standoff is taking place in town square. Hands rest on pistol butts, but nobody's willing to draw first because one gang has a wizard with a pack of ghostly playing cards, and the posse after them has a steam-powered gatling revolver. 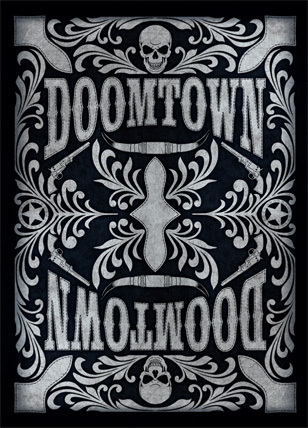 This is the world of Doomtown, the weird western Deadlands card game that rose like the desert sun this year after its death in the late 1990s. 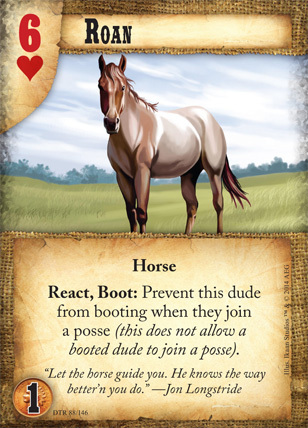 Remade as a non-collectible expandable card game and stuffed with quality components, it already has one expansion (Called a "Saddlebag") with another on the way. While its mechanics might be considered too complex for many, there are deep layers of satisfying randomization because of the poker hands built into every game card. That's why since our original review, the game has more than grown on us. 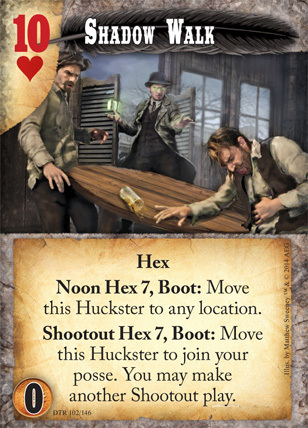 See, in Doomtown battles are decided between players by drawing cards from your deck, because each card has its own built-in suit and value on the top right, you then construct poker hands. 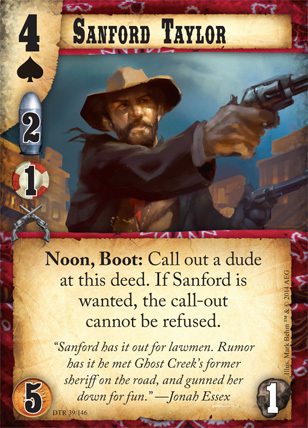 Those hands have values, which determine who dies in the ensuing shooutout - and whether they're simply wounded back into someone's deck or if they go to Boot Hill along with every copy of the same named card. 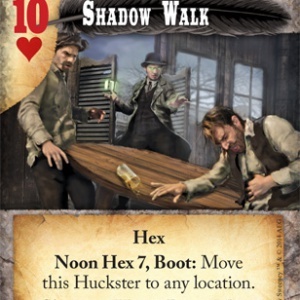 As you're maneuvering your posses of dudes around, you're building a boomtown by placing properties, and by vying over control of those with your opponents you gain enough share of the town to win. 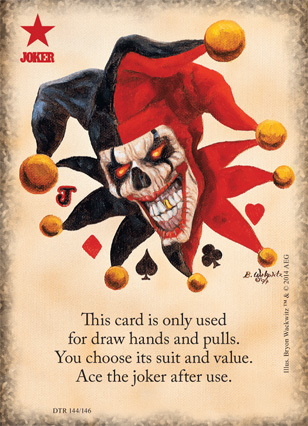 None of this mentions the game's ingenious deckbuilding, where you've got to balance the utility of each card with its suit and value, trying to build in combinations for good poker hands without drawing a "cheatin' hand" too often - because someone's going to nail you to the wall if you're cheatin' too often. 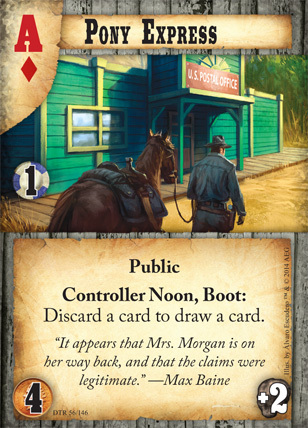 And that doesn't even factor in how well Doomtown scales to three or even four players with simply the core set. 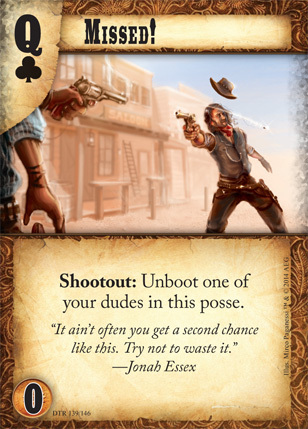 With clever mechanics, lovely art, and an engaging theme, Doomtown captures the spirit of the best of card games with few of the drawbacks. Next up, Best Board Game of 2014. Click here!